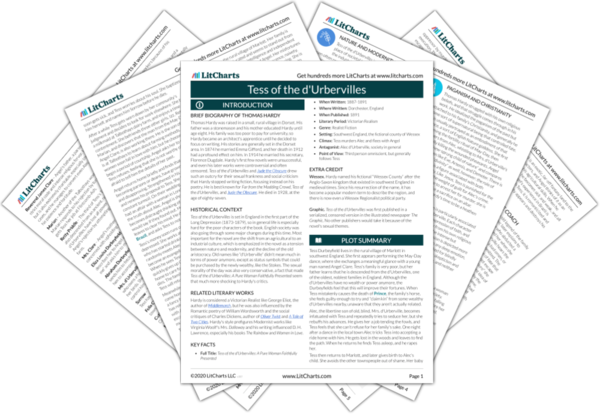 Instant downloads of all 946 LitChart PDFs (including Tess of the d'Urbervilles). 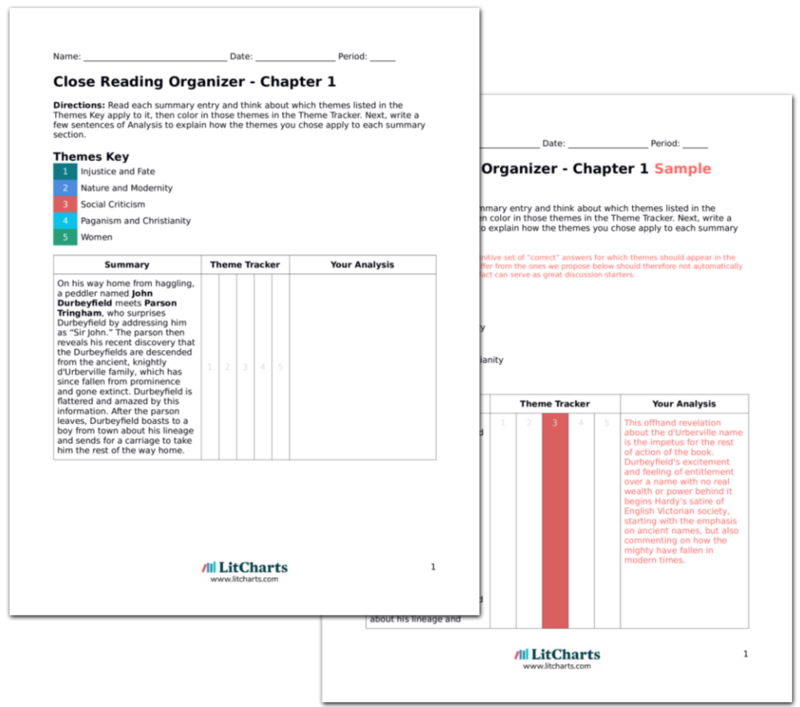 LitCharts assigns a color and icon to each theme in Tess of the d'Urbervilles, which you can use to track the themes throughout the work. The men and dairymaids all rush out and start to milk the cows. Richard Crick, the master-dairyman, is slightly better dressed than the rest, and Tess seeks him out. He greets her kindly and mentions the old d'Urberville race from the area, but Tess changes the subject. He asks about her milking skills and then she gets right to work. Despite her hopefulness and totally new surroundings, Tess is immediately reminded of the past. She can never truly escape it, as it is tied also to her future. Tess drinks a little milk as she works, which surprises Dairyman Crick, whose stomach can't handle it. It is a large farm, and some cows are harder to milk than others. They work in silence, and then some of the workers complain of less milk than usual. They speculate about Tess's arrival and various folk superstitions, but then decide to sing to comfort the cows. Tess is more in accord with Nature than even the dairy farmer, whose stomach can't digest the raw milk. Tess is where she belongs now, outside, among animals, and singing. After many verses a worker and the dairyman address an unseen male milker as “sir,” asking him to play his harp. Crick tells a story about a man who had to play his fiddle to keep a bull from goring him, and finally perform a Christmas song so the bull would kneel and he could escape. The unseen milker remarks on the fascination of the story in a detached, curious manner. There is a build-up to introducing this character that shows he will be important to the story. His comments about Crick's tale show him to be of a different class, and not at home among the rural superstitions and legends. Tess becomes intrigued by the man, though she still can't see him behind his cow. The dairyman gives him tips on milking. Finally the man stands, and Tess sees that he has a different look from the rest of the workers. Tess also recalls that she has seen him before, at that May-Day clubwalk long ago when he did not dance with her. Again Tess's past jumps out at her again, but this time it is an innocent past, before she knew she was a d'Urberville. There is still hope that she can recapture that time in this agricultural setting. 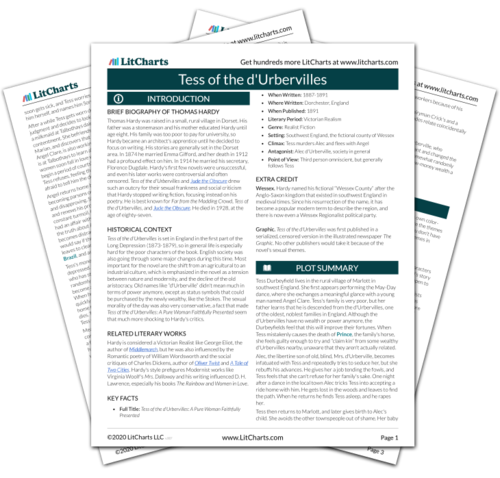 Get the entire Tess of the d'Urbervilles LitChart as a printable PDF. Remembering the past upsets Tess for a while, and she fears the man knows her story and will recognize her. He has matured and grown more handsome and thoughtful since they last met, and is well-dressed under his work clothes. She can tell he is inexperienced at milking. Meanwhile many of the other dairymaids comment on Tess's beauty. The man differs from the rest of the workers in both his manner and attire, as he is from a higher social class. He wants to join the agricultural aspect of society but is both not naturally a part of it and still inexperienced. Tess is one of only a few girls who sleep and eat at the farm. She goes to bed and tries to sleep, but another girl keeps talking, and eventually reveals some information about the mysterious man; his name is Angel Clare, he is a parson's son, and he is at Talbothays to learn one of the many aspects of farming. His father is Reverend Clare, whose name Tess recognizes as the earnest preacher. All of his sons except Angel are becoming parsons as well. There is already a small coincidence with the mention of Reverend Clare, whom the quote-painting man recommended. It is noted that Angel has broken away from his family's tradition and is studying farming instead. Cosby, Matt. "Tess of the d'Urbervilles Chapter 17." LitCharts. LitCharts LLC, 3 Nov 2013. Web. 25 Apr 2019. Cosby, Matt. "Tess of the d'Urbervilles Chapter 17." LitCharts LLC, November 3, 2013. Retrieved April 25, 2019. https://www.litcharts.com/lit/tess-of-the-d-urbervilles/chapter-17.